The lifestyle guide of great food & hotels! GST 0 + Tong Kee Anniversary 30%, Let’s Celebrate! It is expected that Subway will eventually change the long ever popular puller RM7.50 Sub-of-the-day which had been quite successful in promoting healthy lifestyle to Malaysians, including myself. - Chicken slice and Meatball remains while Seafood & Crab and Veggie Delite are introduced. 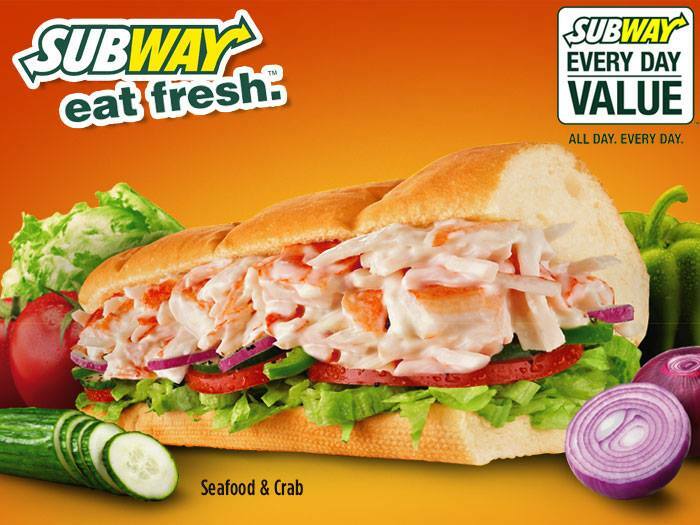 Generally speaking, it is a good news for the vegetarians and crab lovers, but it is bad for Subway and the regulars as their signature is B.M.T. and also tuna fans. Many fans had voiced and prefer Subway to continue with the popular ones. Perhaps they can replace some chicken with other options. Of course, the adjustment of pricing is anticipated and unavoidable. This entry was posted on Monday, May 5th, 2014 at 4:17 pm	and is filed under Cafes, Food Promo, Heavenly Klang Valley Food. You can follow any responses to this entry through the RSS 2.0 feed. You can leave a response, or trackback from your own site.